Outdoor living is a term used a lot these days. It encompasses the enjoyment of your outdoor space with lots of amenities. It can be a simple patio with built in benches to the extravagance you see on Pinterest and HGTV including fire pits, pavers and outdoor kitchens. People who install outdoor living spaces want to extend their home to the outdoors. They love nature but don’t have time to go out searching for it. They love to entertain and have laughter filling their home and space. Enjoy a quiet evening or have the whole neighborhood over for a poolside BBQ. Reconnect with family and friends. Create your own social network in your backyard. If you love a natural sanctuary and love inviting people over, an outdoor living space is a great upgrade that you’ll enjoy for many years. Patios can incorporate many styles of pavers to show off varying styles and tastes. Some may require grading of the installation area but size is never a factor. When we design a patio, we take your plans of space utilization into consideration. Some factors include furniture choice, number of people on the patio, elements such as fire pits, fire places, outdoor kitchens. Even if you can't afford to see your vision fully realized now, we can install the patio with your future plans in mind. We often do jobs in phases, growing the living space from a simple patio to a full outdoor space over time. Waterfall and Koi pond were added as an accent to an outdoor living space in a small back yard. 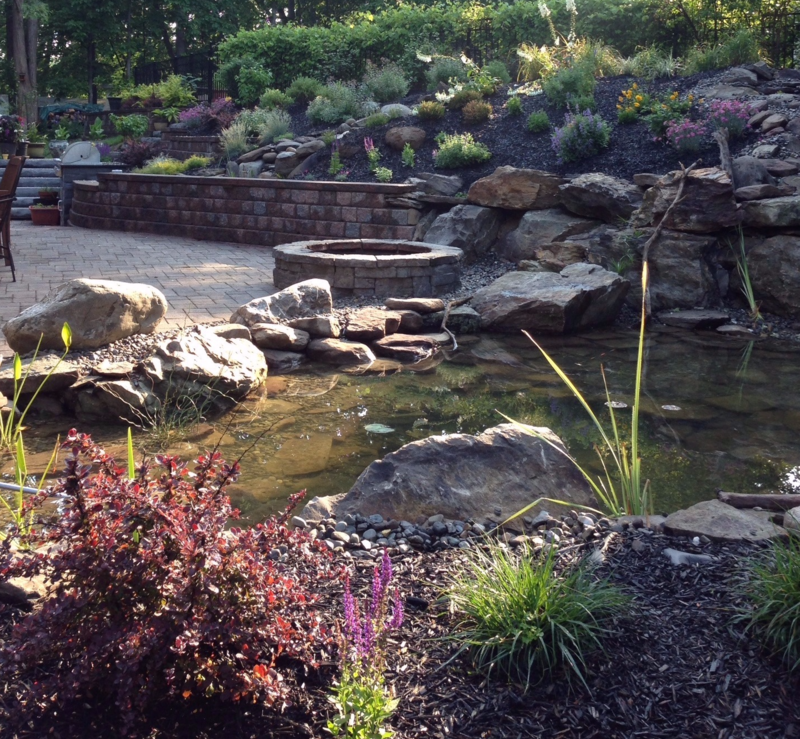 This particular project was a 13x25 foot pond with 2 waterfall structures. The look and sound of the water were so appealing to them that they increased the size and scope of the project after our initial proposal. Waterfalls and other water features provide interest and bring a unique element to the outdoor space. They add to relaxation and tranquility to the living space. If you need to make a tough decision, flowing water helps you bring your mind to a quiet place to make those decisions. Whether you meditate or just enjoy a place to feel calm and stress free a water feature can accomplish it.